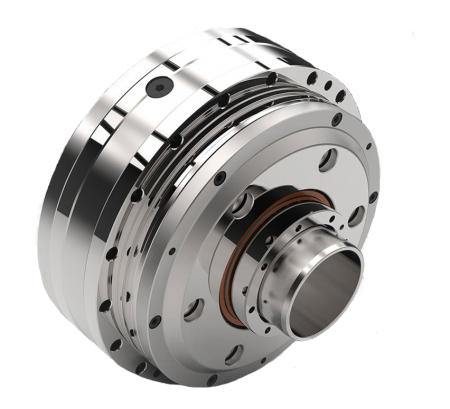 Twinspin bearing reducers are high precision bearing reducers based on a new reduction mechanism and a new construction solution using radial-axial rolling bearings and represent a new generation of power-transmission systems. Available in 9 frame sizes, 33 to 191:1 reduction ratio, 37 to 2940 Nm cont. torque, 1 arc/min backlash, pancake design. Used for robotics and automation, machine tools, measuring devices, navigation systems, aircraft, military and medical equipment, woodworking, printing, textile and glass working machines, and filling machines. T Series represents the standard version of the TwinSpin bearing reducer. E Series of reducer represents a compact unit with possibility of lifetime sealing and filling by oil. H Series Hollow Shaft – completely sealed reducer. Larger hole in the input shaft allows the cables, tubes or additional shaft to pass through the reducer. The Modules with the identification “B” so-called footing modules are of casing construction that enables simple and safe fitting of the module to the base frame. The modules with the identification “A” are called the flange modules. Their advantage is their small dimensions and weight that what enables their using mainly in moving parts of the rotary positioners.